The French island of Corsica lies southeast of the mainland in the Mediterranean Sea. Created by violent volcanic eruptions, Corsica is the most mountainous region of the Mediterranean, and is nicknamed the “scented island” because of the intoxicating perfumes that fill its bush lands. Historic towns, laid-back resorts, isolated anchorages, imposing ancient watchtowers, and magnificent beaches make sailing in Corsica waters an unforgettable adventure in a less traveled Mediterranean paradise. Corsica gentle Mediterranean climate has promoted rich evergreen forests, and protects a wide variety of bird species. Several endangered animals thrive in the southern alpine mountains of snow-capped glaciers, and the Scandola Nature Reserve is a UNESCO World Heritage site. - The ultimate in privacy & freedom, bareboat rentals are for groups having their own qualified skipper. Hiring a captain and or hostess/cook always remains an option. 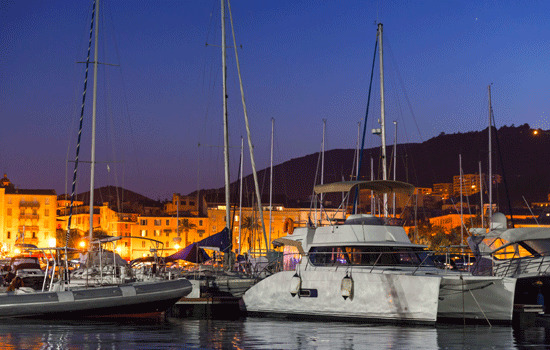 For a list of our available Bareboat yachts, please Click Here. Ajaccio is the capital city of Corsica. It is also the largest settlement on the island. Ajaccio is located on the west coast of the island of Corsica, 210 nautical miles (390 km) southeast of Marseille. It is also a shopping centre with the commercial streets of the city centre and the areas of peripheral activities such as that of Mezzavia (hypermarket Géant Casino) and along the ring road (hypermarket Carrefour and E. Leclerc). Tourism is one of the most vital aspects of the economy. A number of hotels, varying from one star to five star, are present across the commune.